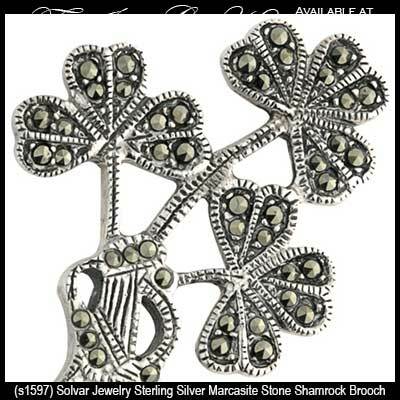 Shamrock brooches are offered in sterling silver or plated designs. Show your Irish pride by wearing a shamrock brooch; the shamrock is recognized throughout the world as an iconic symbol of Ireland. 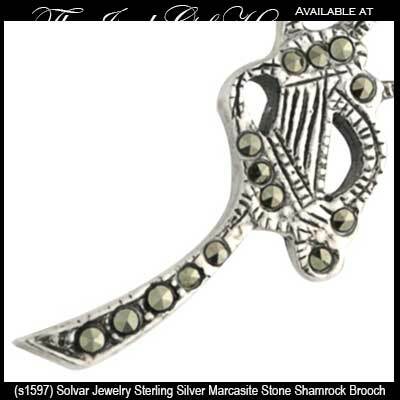 Silver shamrock brooch features sterling construction that is studded with marcasite stones and is accented with an Irish harp on the stem. Shamrock brooch is a silver plated design that is enhanced with green enamel and crystals. Shamrock brooch is a rhodium plated design that is augmented with the colors of pastel crystals. Shamrock brooch is a substantial design with a gold plated finish. Shamrock pin features a gold plated finish that is enhanced with green enamel leaves. A brooch may be one of the most adaptable items in your jewelry collection and one that displays the shamrock may be closest to your heart. You may also wish to accessorize with pieces with the same Irish symbol so please take a look at our gold shamrock necklaces and the shamrock earrings. The Irish Gift House also features a large collection of similar designs including our collection of Celtic brooches. Additionally, we have depth in our variety of Claddagh brooches and those with the Celtic cross. The Irish Gift House features shamrock brooches and pins from Solvar.